Goldsboro NC Jan. 17th, 63. Click image of USA General Grant’s forces encamped at Oxford, Mississippi to learn more. Click image of Henry G. Fernandez to view source. I learned also that they had burnt Fernandez house- and cut up generally, but as yet, I have heard nothing positive. Image is of Southern men taking the Oath of Allegiance to the United States. Click image to learn more about CSA Brigadier General Joseph Robert Davis. The last letter I rcd from home was just after we left Cullpeper Cty. We left our old Brigade to form one composed of Miss boys commanded by Joe Davis a nephew of Jefferson- We staid at Richmond a month, when we were ordered to this place where the Yankees were trying to make an entrance- They had a small fight at H Kinston, 20 miles below and came up this far when they burnt the K Rail Road Bridge, but hearing that we were on our way here to reinforce they retreated back to Newborn where there is now said to be about 50,000 intending to attack this place Welden and Wilmington, but there is no telling what they will do. Click image of North Carolina’s 1861 flag to prepare for your visit to this friendly state. I am much better pleased with the old North state than I expected- We are living high, at this time on corn dodgers and Potatoes- rareties that we have not been used to- The people around here have not much wealth but they are good livers and as are as free hearted a people as it has ever been my lot to meet with. We are encamped in a perfect Pine Thicket and it takes all the soap we can get to keep the Pine smoke off. We have a snug chimney to our tent and can fare finely this winter if they will only let us stay here- but our movements will be altogether owing to the movements of the enemy. 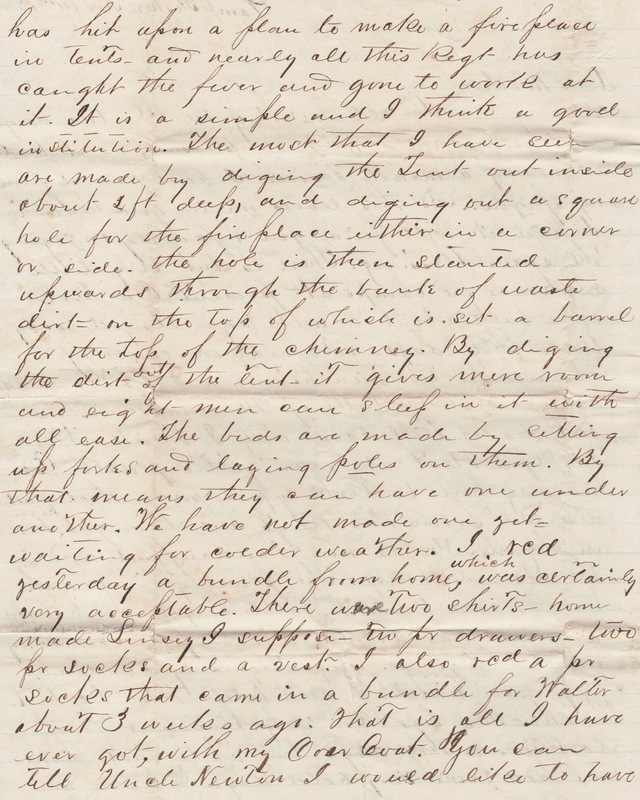 This letter contains several complex topics. 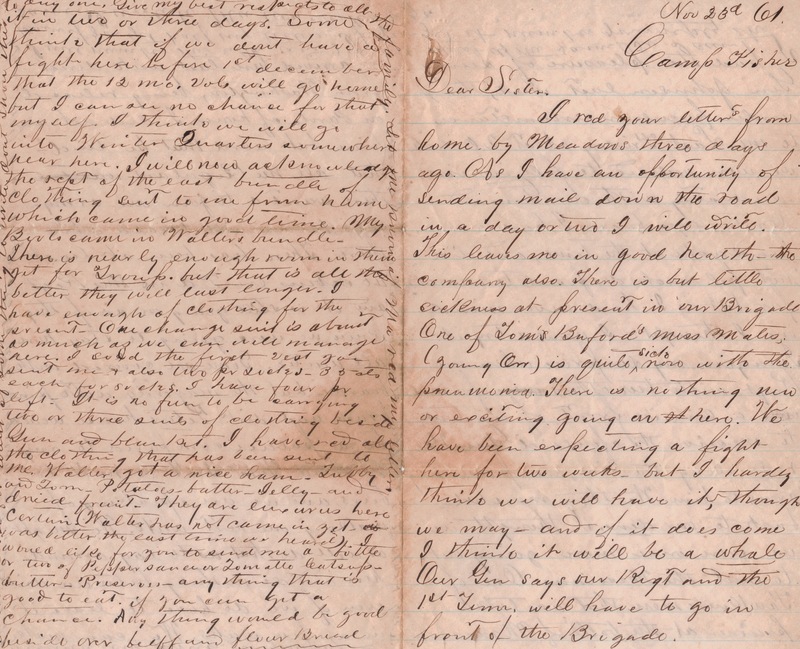 The Emancipation Proclamation went into effect 16 days before this letter was written. 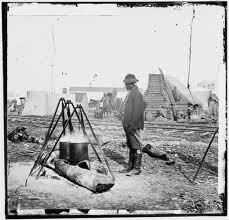 Total war upon civilian population shattered the morale of Southerners at home and serving far away. Click image to learn about UDC. Those who took the Oath of Allegiance to the United States before the war’s end were viewed as traitors and cowards. No Confederate ancestor who took the Oath of Allegiance before April 9, 1865, shall be eligible to be used for application for membership within the United Daughters of the Confederacy. If proof of further Confederate service is available, thereby nullifying the Oath of Allegiance, the ancestor shall be considered for approval. John Buford, likely an extended family member who served in a different regiment, is mentioned by Parham when he writes of the death of so many good and brave men by the ball of the vile invader. Joseph (Joe) R. Davis, CSA Brigadier General, nephew of Confederate President Jefferson Davis, served in Mississippi senate during pre-war years. 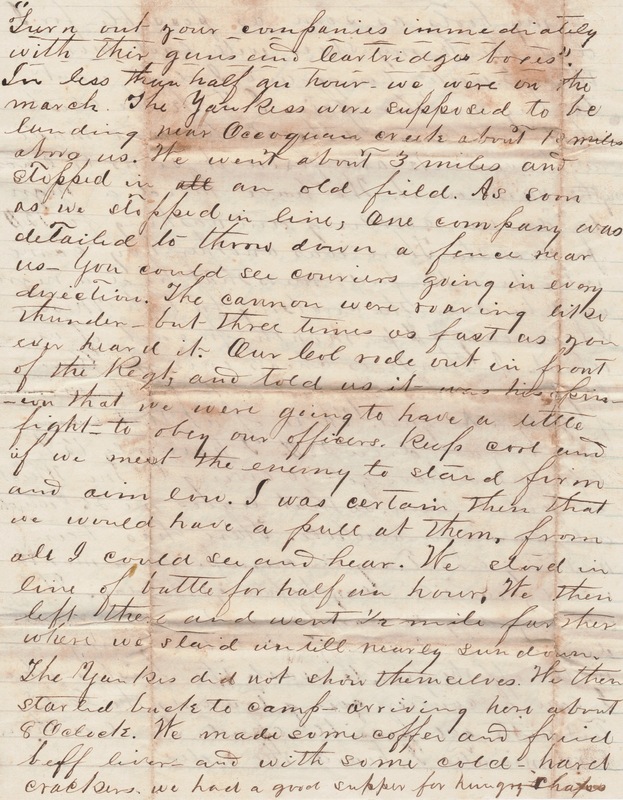 Thomas (Tom) P. Buford, Parham’s cousin who brought the camp news of Northern operations in Oxford, enlisted April 26, 1861; twenty-eight years old and single. He was present at Seven Pines; was reported sick for several months of catarrh and bronchitis on Blackwater near Suffolk; he was furloughed to Mississippi. His health was restored…and he returned to duty near Orange Court-House, in time to be present on 5th and 6th of May, 1864, at the battle of Wilderness. On his last day of this engagement he was shot through the left thigh and sent to hospital at Richmond; from there he was furloughed again. 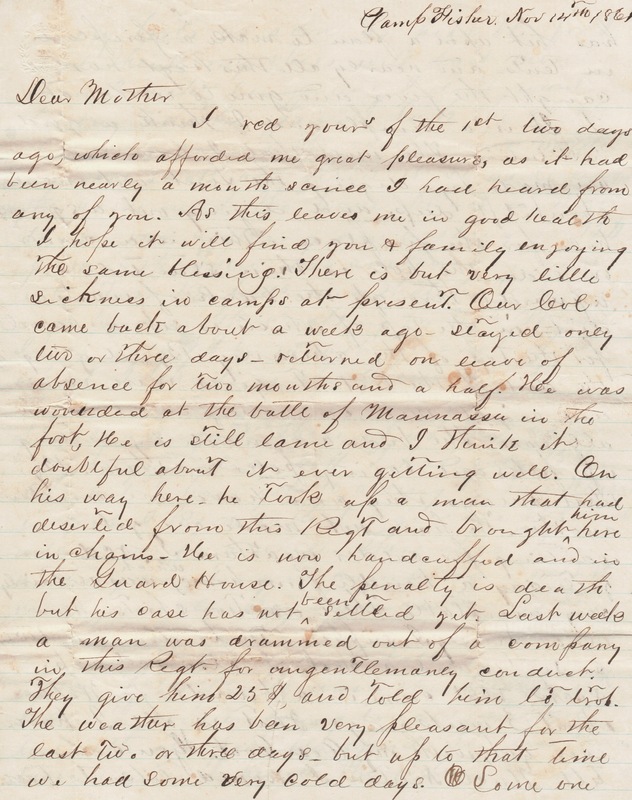 He had so far recovered from this wound as to return…in the trenches near Petersburg, Va. He was present at Jones Farm, Hatcher’s Run, and Hawkes Farm, where he was again wounded, this time in the left knee; was sent to Richmond Hospital, 26th of March, 1865. Gangrene attacked the wound and for weeks and months he was prostrated; was able to travel 1st of June…and (with his brother Warren) reached home July 1, 1865. Henry G. Fernandez, whose house was burned during the Union occupation, enlisted April 26, 1861; twenty years old and single. He was present first and second days at Seven Pines, Gaines’s Farm, White Oak Swamp, Malvern Hill, Freeman’s Ford, Thoroughfare Gap, first day, Second Manassas, second day, Sharpsburg; first day, Gettysburg, Falling Wilderness, and on account of ill health was never with the Company any more. I rcd your letters from home by Meadows three days ago. As I have an opportunity of sending mail down the road in a day or two I will write. This leaves me in good health – the company also. There is but little sickness at present in our Brigade One of Tom’s Buford’s mess mates (young Orr) is quite sick now with the pneumonia. There is nothing new or exciting going on here. 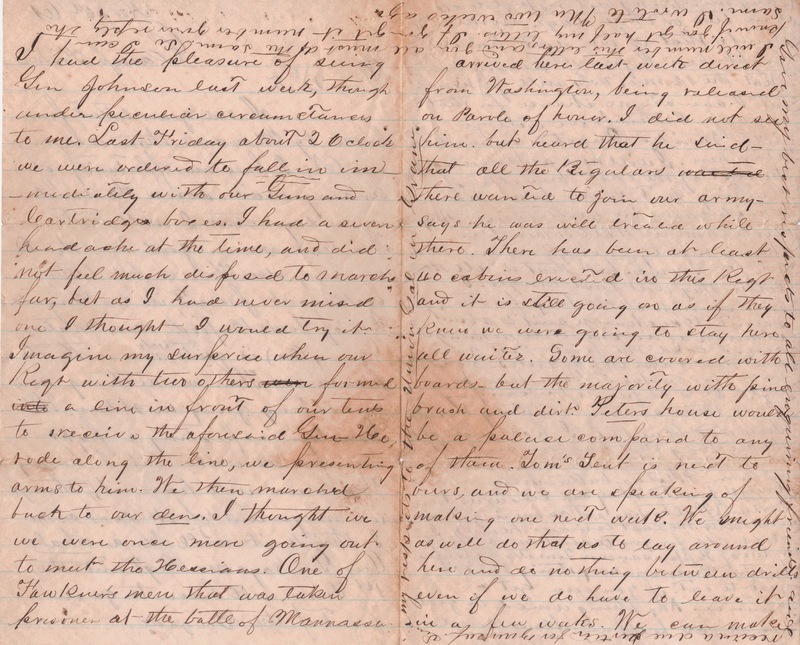 We have been expecting a fight here for two weeks – but I hardly think we will have it, though we may – and if it does come I think it will be a whale Our Gen says our Regt and the 1st Tenn. will have to go in front of the Brigade. Click image to listen to song about Hessians. I had the pleasure of seeing Gen Johnson last week, though under peculiar circumstances to me. Last Friday about 2 Oclock we were ordered to fall in immediately with our Guns and Cartridge boxes. I had a severe headache at the time, and did not feel much disposed to march far, but as I had never missed one I thought I would try it. Imagine my surprise when our Regt with two others were formed into a line in front of our tents to receive the aforesaid Gen-He rode along the line, we presenting arms to him. We then marched back or our dens. I thought we were once more going out to meet the Hessians. One of the Hawkner’s men that was taken prisioner at the battle of Mannassa arrived here last week direct from Washington, being released on Parole of honor. I did not see him. but heard that he said – that all the Regulars there wanted to join our army – says he was well treated while there. There has been at least 40 cabins erected in this Regt and it is still going on as if they knew we were going to stay here all winter. Some are covered with boards – but the majority with pine brush and dirt. Peters house would be a palace compared to any of them. Tom’s Tent is next to ours, and we are speaking of making one next week. We might as well do that as to lay around here and do nothing between drills even if we do have to leave it in a few weeks. We can make it in two or three days. Some think that if we don’t have a fight here before 1st decemeber that the 12 mo. vols will go home but I can see no chance for that myself. I think we will go into Winter Quarters somewhere near here. I will now acknowledge the rcpt of the last bundle of clothing sent to me from home which came in good time. My Boots came in Walters bundle- There is nearly enough room in them yet for Group. but that is all the better they will last longer. I have enough clothing for the present. One change suit is about as much as we can well manage here. I sold the first vest you sent me and also two pr socks – 35 cts each for socks. I have four pr left- It is no fun to carrying two or three suits of clothing beside Gun and blanket. I have rcd all the clothing that has been sent to me. Walter got a nice ham- Tubby and Tom – potatoes – butter – jelly – and dried fruit. They are luxuries here certain. (Walter has not come in yet- is was better the last time we heard). I would like for you to send me a bottle or two of Pepper sauce or Tomatto Catsup – butter – Preserves – any thing that is good to eat. if you can get a chance. Any thing would be good besides our beeff and flour Bread. I must close for want of something to write. dont show this to any one. Give my best regards to all the family. Let me know if Ma rcd my letter. I will number this letter, and you all must do the same. so I can know if you get half my letters. If you get it number your reply the same. I wrote to Ma two weeks ago. Give my best respects to all enquiring friends and receive a due portion for yourself. Send my respects to the Union Gal in Grane. Click image to learn about CSA General Joseph E. Johnston. 1. Parham may have misspelled the name of the general he saw by leaving out a “t”. It may be General Joseph E. Johnston he wrote about. 2. 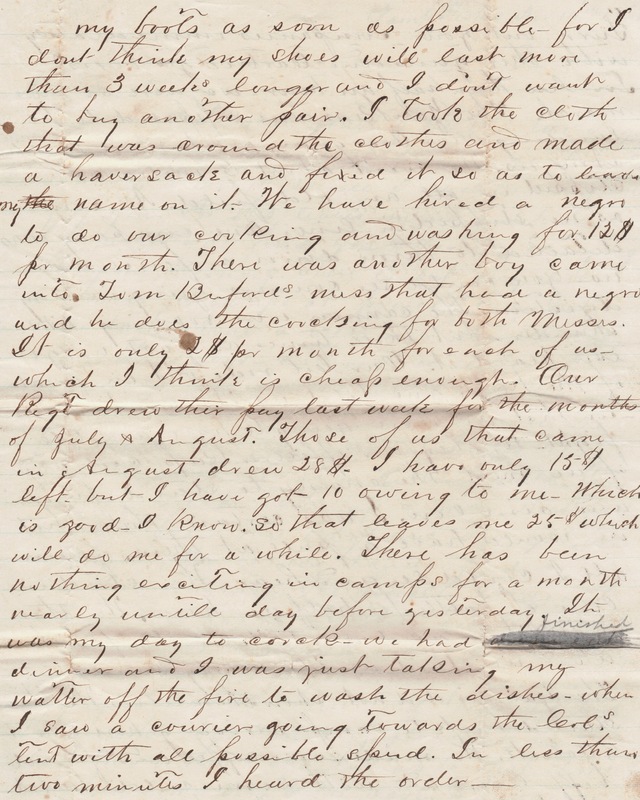 Parham wrote of young Orr having pneumonia. There were two individuals by the name of Orr in Company G of 11th Mississippi, both equally young at the age of 23 during enlistment in 1861. Young Orr is either Charles W. Orr or Ira Baxter Orr. Click image to learn about Hessians. 3. 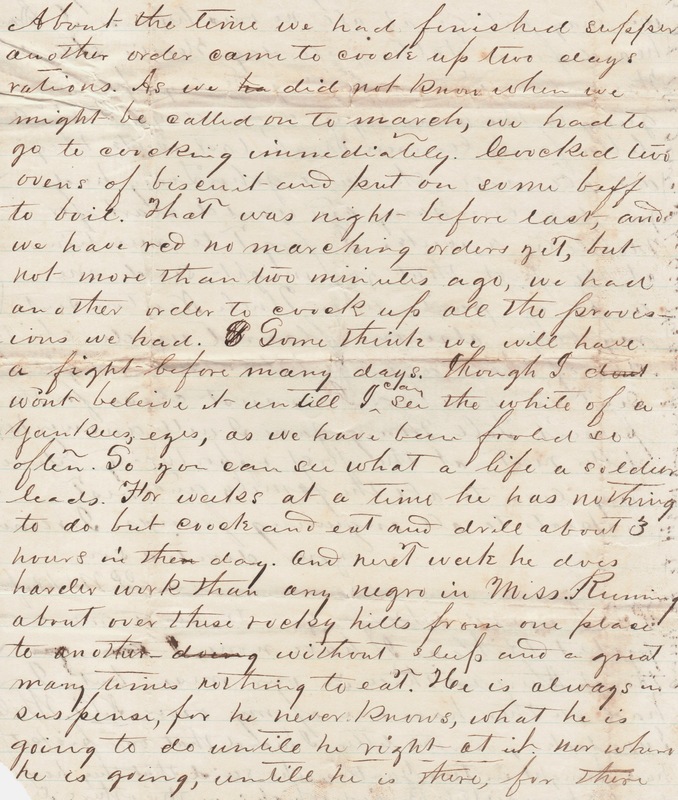 Parham refers to Hessians in this letter which is what many Confederates of the time called German immigrants volunteering for service in the Union army. Many of the Hessians had previously fought or were sons of fathers who fought in the old country during the German Revolution of 1848-1849. Some of the Hessians identified the Union cause as a continuation of the ideas held by the European revolutionaries. 4. 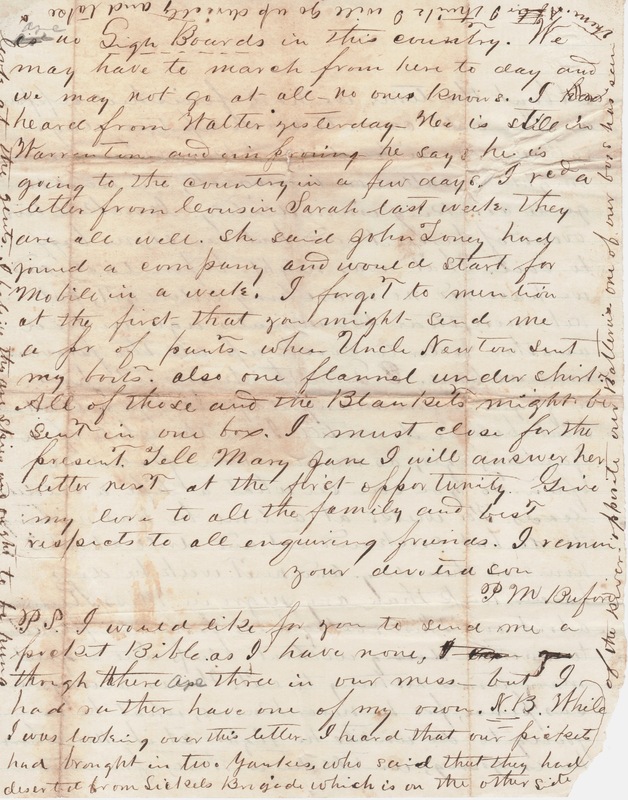 Parham mentions Hawkner and Peters by name and concludes the letter by sending his respects to the Union Gal in Grane. Who are these people? 5. ”Tubby” is Goodloe Warren Buford, Jr.